Twelfth Night and The Tempest: Meet the Directors! BMH’s incredible production of Twelfth Night and The Tempest is starting tomorrow! We spoke with the play’s two directors, Cate Nunn and Alex Coke, to find out why these two plays go so well together and what they’re most excited about their audience seeing. Be part of the audience by booking your tickets today – book online here. What is it like working with another director to create one whole production out of two plays? Well it helps that we get on really well! We’ve worked together on so many productions since we first met in 2014, in all different capacities, that to be honest it’s hard to imagine doing shows without one another! This is the first time we’ve co-directed, but as soon as we started talking about the two plays, we found we had a really similar vision for the whole production – but we think about things in different ways, so we complement each other really well. Coming up with our concept at the start, we found that Cate starts with visuals and Alex with music; in rehearsals Alex is very organic whereas Cate’s a nit-picker – so we balance each other really well, while keeping the show heading firmly towards our joint vision and supporting each other whenever we need to unpick a problem or thrash out an idea. It’s been a fantastic experience! Why did you choose these two plays? We were both involved in BMH’s Shakespeare double-bill at the Castle last year, Macbeth & A Midsummer Night’s Dream, and we loved how the “two plays in two hours” concept let us deliver Shakespeare in a fresh, pacy and accessible way. Those two plays were linked by the theme of magic – and we realised there was another pair of obviously linked plays staring us in the face: Twelfth Night & The Tempest, both linked by the theme of storms, shipwrecks, and outsiders cast adrift in strange “brave new worlds”. As well as the things that link the plays, there are great contrasts to explore as well – Twelfth Night is a delightful tale of the search for true love, whereas The Tempest is much darker and more mysterious. We were sure the two plays would go together to make a really exciting and interesting double-bill for our audience. What is it like working with the same cast for both plays? What’s it like directing shows for the castle space? We both love doing shows at the Castle – it’s a beautiful and atmospheric setting, but it also gives you so much scope to go big. We’ve got a large cast (16 in total) and sometimes in indoor spaces that can result in big crowd scenes looking crunched, or having to restrict what you can do with dances or fights because there isn’t room to really let rip – whereas with the whole Castle courtyard to work with, we’ve been able to really let our imaginations loose! And there’s nothing quite like the Castle as the sun goes down, when all the old stonework gets illuminated, and you have all the trees on the mound silhouetted above you – it’s a fantastically atmospheric space. 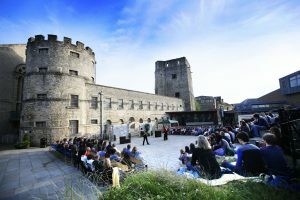 What are you most excited about for the production weeks at the castle? That one’s easy! We can’t wait to see the whole production up and running – and to introduce audiences to our bunch of mysterious island spirits, monsters, drunken rabble-rousers, wistful lovers, scheming plotters, pirates, shipwrecked travellers, and one yellow-stockings-wearing butler! Book now to see Twelfth Night and The Tempest for yourself! 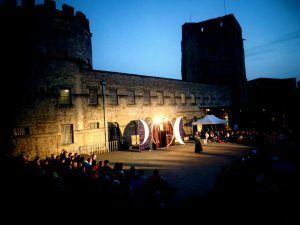 The production will run from Monday 19 June to Saturday 1 July from 7.30pm in the castle’s historic Castleyard.